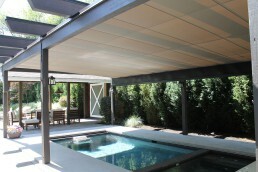 Despite a large swimming pool and existing dual track retractable awnings, this interlock backyard was always too hot for homeowners and guests to enjoy. As a result, the “Decked Out” crew was determined to provide just the right amount of shade coverage over two separate outdoor living spaces. 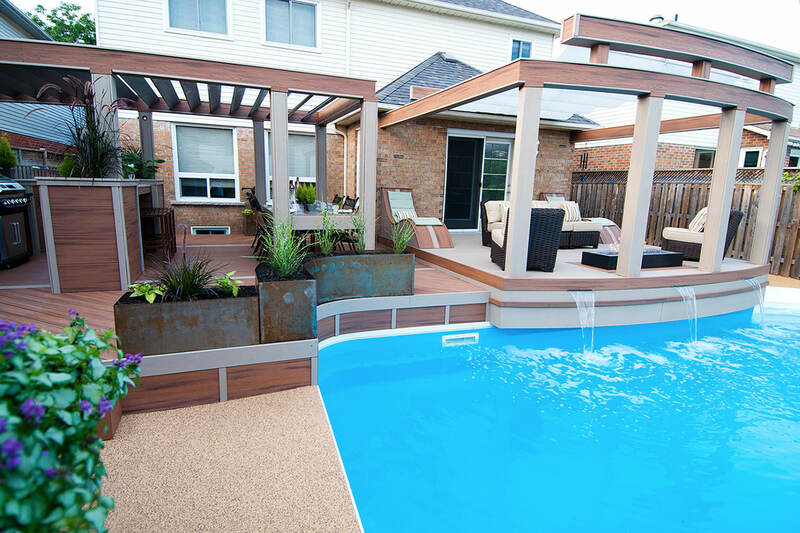 The first step was to create transitional spaces that flowed into each other, as well as the pool. 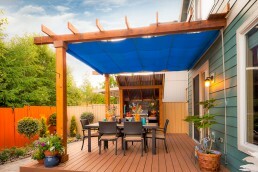 The second step was to provide enough shade coverage so that the overexposed backyard was still accessible when the sun was at its strongest. 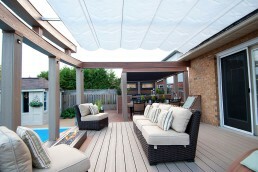 However, there remained a minor dilemma, when Paul LaFrance asked the homeowners to choose between sun or shade, the couple remained divided, leading LaFrance to conclude that versatility was necessary. Throughout the building process, the old retractable awnings provided little shelter from the rain or sun and were eventually torn down. 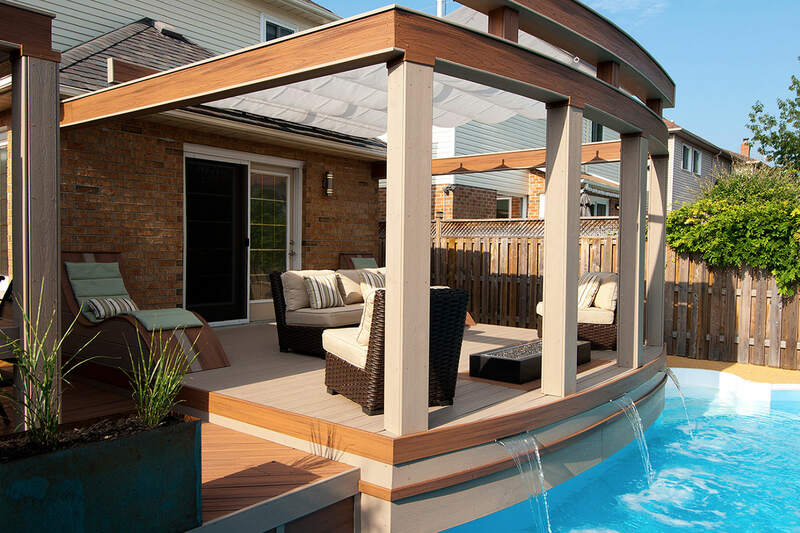 Despite this, the Decked Out Crew pushed on to create a beautiful steel enforced deck, a soothing waterfall feature, expansive entertaining space with customized table and a relaxation deck worthy of a five-star resort. The final piece of this ‘decked out’ makeover was our ShadeFX retractable patio cover, which after the quick and easy installation, led LaFrance to joyously declare, “Finally, we have Shade!” When the project was finally unveiled to the couple, Anita, one of the homeowners, turned and exclaimed to her partner, “This awning is beautiful, you can be in shade, and I can be in the sun on these beautiful loungers”. The design and execution by Paul LaFrance and his ‘Decked Out” Team met all the expectations of the homeowners and then some. Summarizing the project, LaFrance, explains that this space had everything and in fact, the “gorgeous outdoor retreat capitalizes on every square inch, and most importantly a retractable awning to protect yourself from the sun”. Once again, it is an honor to contribute to the amazing designs and innovation done by Paul LaFrance Design and the “Decked Out” Crew, we always look forward to doing it again!